DeepMind Develops a Neural Network That Can Make Sense of Objects Around It. This is not only misleading, but it also makes the everyday non PhD person intimidated. In this post I will go through the paper in an attempt to explain this new architecture in simple terms. This article assumes some basic knowledge about neural networks. I will follow the paper’s structure as much as possible. I will add my own bits to simply the material. 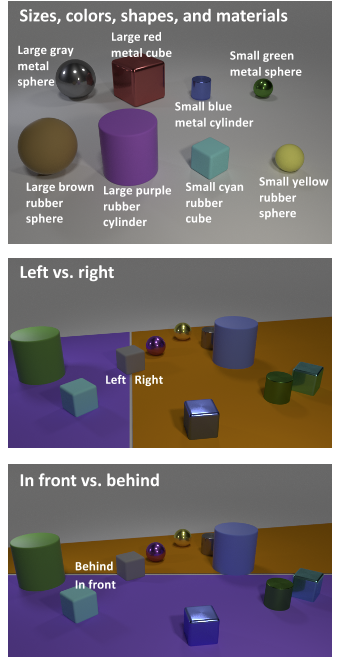 Figure1.0 The model has to look at objects of different shape/size/color, and be able to answer questions that are related between multiple such objects. The Relational Network for O (O is the set of objects you want to learn relations of) is a function fɸ. gθ is another function that takes two objects :oi , and oj. The output of gθ is the ‘relation’ that we are concerned about. Σ i,j means , calculate gθ for all possible pairs of objects, and then sum them up. Both gθ , and fɸ are multi layer perceptrons in the simplest case. The authors present Relational Neural Network as a module. It can accept encoded objects and learn relations from them, but more importantly, they can be plugged into Convolutional Neural networks , and LSTMs. The Convolutional network can be used to learn the objects using images. This makes it far more useful for applications because reasoning on an image is more useful than reasoning on an array of user defined objects. The LSTMs along with word embeddings can be used to understand the meaning of the query that the model has been asked. This is again , more useful because the model can now accept an English sentence instead of encoded arrays. The authors have presented a way to combine relational networks, convolutional networks , and LSTMs to construct an end to end neural network that can learn relations between objects. Figure 2.0 An end to end relational reasoning neural network. The image is passed through a standard Convolutional Neural network(CNN), which can extract features of that image in k filters. The ‘object’ for the relational network is a vector of features of each point in the grid. e.g. one ‘object’ is the yellow vector. The question is passed through an LSTM , which produces a feature vector of that question. This is roughly the ‘idea’ of that question. Notice the extra q in Equation 1.0. That q is the final state of the LSTM. The relations are now conditioned using q. After that, the ‘object’ from the CNN and the vector from the LSTM are used to train the relational network. Each object pair is taken, along with the question vector from the LSTM, and those are used as inputs for gθ(which is a neural network). The outputs of gθ are then summed up , and used as inputs to fɸ(which is another neural network). fɸ is then optimsed on the answer to the question. The authors demonstrate the effectiveness of this model on several datasets. I will go through one of them (and in my opinion the most notable) — CLEVR dataset. Is the cube the same material as the cylinder? The authors point out that other systems are far behind their own model in terms of accuracy. This is because Relational networks are designed to capture relations. Relational Networks are extremely adept at learning relations. They do so in a data efficient manner. They are also flexible and can be used as a drop in solution when using CNN’s, LSTMs, or both. This post was about debunking the ‘AI has taken over’ hype caused by very large publications, and giving some perspective on what the current state of the art is.